It's that time of year again. Time to "Fall Back" thanks to the END TO Daylight Saving Time. This year we turn our clocks back the day after Halloween. Luckily with today's technology, all our clocks, phones and cable boxes automatically update themselves. When Daylight Saving Time ends in the Fall, My body thinks I should start getting ready for bed at 7 p.m.
National Fire Protection Association encourages everyone to use Daylight Saving Time, aka DST, to mark the time of year you check on your Smoke Detectors. This would be a good routine to make sure batteries in your smoke detectors are replaced and all your smoke detectors are in working order. The article specifically states to check on smoke detectors as DST begins. I suspect is because the article was written in March. For me and my household, we use both Spring Forward and Fall Back to make sure our family is properly protected. Claudia S. Nelson is a Woodbridge VA Realtor with Keller Williams Realty located in Woodbridge VA. She lives and works right here in our Woodbridge VA Community. For All Your Woodbridge VA Real Estate Needs, contact the VA Real Expert, Claudia S. Nelson at 571-446-0002. 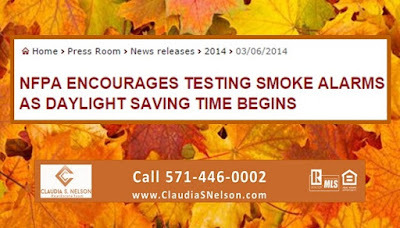 For More Tips by Claudia, Check out some of her recent articles. 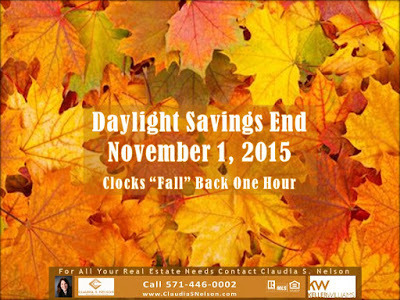 This entry was posted in Claudia's Tips, Keller Williams of Lake Ridge, Keller Williams Woodbridge VA, Woodbridge VA and tagged 571-446-0002, Change clocks 2015, Claudia S Nelson Woodbridge VA, Daylight Saving Time 2015, DST Ends, Fall Back, Spring Forward, Tips from Woodbridge VA Real Estate Agent, Woodbridge VA Realtor, www.ClaudiaSNelson.com by claudianelson. Bookmark the permalink.